Sweetener Offers A Delicious Way To Sweeten Foods And Beverages While Using Less Paper Than Traditional Packets. 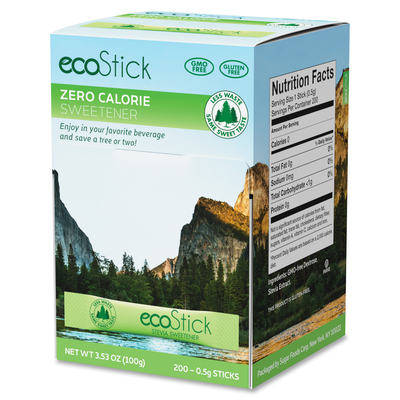 These Ecosticks Are Gmo-Free And Gluten-Free. They Contain The Same Level Of Sweetening Power As Regular Packets. Smaller Size Reduces The Amount Of Space Required For Display And Storage, And Reduces Waste. Packets Are Perfect For Keeping In Reception Areas, Breakrooms And More. Sweetener Is A Proud Supporter Of The National Park Foundation And Reforest Patagonia.. Sweetener Offers A Delicious Way To Sweeten Foods And Beverages While Using Less Paper Than Traditional Packets. These Ecosticks Are Gmo-Free And Gluten-Free. They Contain The Same Level Of Sweetening Power As Regular Packets. Smaller Size Reduces The Amount Of Space Required For Display And Storage, And Reduces Waste. Packets Are Perfect For Keeping In Reception Areas, Breakrooms And More. Sweetener Is A Proud Supporter Of The National Park Foundation And Reforest Patagonia.